Let's enjoy the summer in Japan! A lot of students from various countries have studied Japanese language at KAI Japanese Language School since it's foundation in 1987. 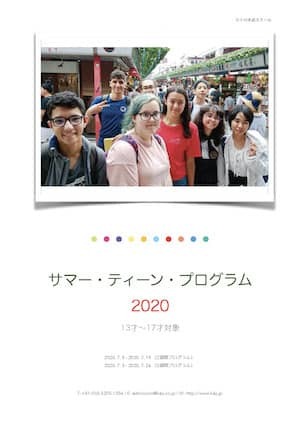 With this abundant experience, KAI prepared a summer junior program where you can fully enjoy Japan and Japanese language. Why don't you experience both traditional and pop culture of Japan along with studying Japanese, and have the best summer of your life?! What's great about the Program? After arriving at Narita or Haneda airport, you will be free of care. Our staff will arrange the transportation between the accommodations, school and activities. They'll even stay at the same accommodations to support you, so your safety is assured. Besides the lessons, the program includes activities every day including weekends, accommodations, breakfasts, lunches and dinners, airport transfer and everyday transfer, etc. Please be aware that drinks and personal expense aren't included. Even though 2 or 3 weeks sounds short, you can learn to greet and introduce yourselves as well as have basic conversations you can use at restaurants and shops during the program. In addition, through our various activities and everyday life in Tokyo, you can understand real Japanese culture and society, which will surely be a great experience for you. This program is designed to steadfastly improve your conversation skills in an enjoyable atmosphere. A lot of speaking exercises are given in each class. You'll be amazed how much you can talk in Japanese after a short period of 2-3 weeks. During the program, you will participate in various kinds of activities to experience both traditional and modern Japanese culture. It will be not only a lot of fun but also you will be very well-versed in Japan when you complete the program. Please refer to our website for more details of the activities. * If the level of the student is too high, the student will attend a Summer Course class. 9 or 14 days of lessons with printed and digital materials. 4 full-day and 9 half-day activities (2-week package) or 6 full-day and 14 half-day activities (3-week package). All breakfasts, lunches and dinners during the program. Airport transfer from/to Narita or Haneda airports. Travel Insurance which is mandatory for participation in the program. The schedule of the program is on the brochure. Please download it from here .